Radio's longest-running private detective wasn't a smart-mouthed, gun-toting wise guy. He was the gentle, dignified, soft spoken Mr. Keen. 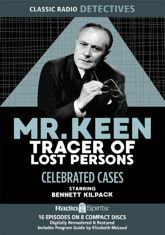 Bennet Kilpack stars as the intelligent investigator in this sixteen-episode collection.